Detoxification is the process that one’s body goes through to rid itself of the presence of drugs, their metabolites and other toxins in the human body. Detox centers are medical institutions where people will go to carryout this process. Detox is necessary in order to pass a drug test without the use of adulterants. For resources on the topics of body detoxification for alcohol and drugs, including liver, colon, detox drinks and diets, see below. Diuretics: diuretics make people urinate frequently. Coffee, cranberry juice, grapes, beer, iced tea and soda pop are all good diuretics. But you may receive only temporarily and inadequate effect using diuretics to cleanse your body from THC. If you want to know if you are clean be sure to use a home drug test kit and test for drugs at home. Vinegar: there is a myth that drinking vinegar will mask drugs ; it won't. Vinegar does in fact lower the pH of urine. It is said that Amphetamines are excreted up to 3 times faster when urine is acidified. So vinegar could reduce the detection time period for amphetamines. But, most urine specimen validity tests now include PH and, if the PH is off, you will have a rejected drug test. Dexatrim: There is a myth that taking phenylpropanolamine (Dexatrim's active ingredient) will work. It won't. In fact, Dexatrim will sometimes shows up as a false positive (for amphetamines), and this will actually work against you. The myth may have originated because Dexatrim was claimed to speed up the body's metabolism. Fiber: a high fiber diet will help by redirecting fat soluble metabolites to the colon rather than bladder. But the effect from a high fiber diet may be temporarily and insufficient. A high fiber diet is known to help detoxify the body. Toxins, like THC are eliminated primarily in the stool via bile acids. A person with a high fiber diet will excrete a majority of THC metabolites in the stool. Fiber-based laxatives may also help by binding bile-acids but these remedies alter one's bowel schedule and may lead to laxative dependency. Exercises: If you have high metabolic rate, toxins will move through your system significantly faster. Exercising between drug tests will clean drug metabolites (like THC) from the systemat a faster rate, thus lowering the detection period. If you want to Detox your body, and show up clean for a drug test, you must cleanse your blood and urine. Exercise increases the amount of THC metabolites in the urine; so quit exercising minimum up to 48 hrs before the test, better a week before the test. Always test yourself before drug test! Home test kits help you know for sure! When in doubt, don't guess - TEST! About home remedies for removing drugs out of your system. THC is fat soluble, and it gets stored in your fat cells. Cleaning it out of your lipid tissue is very difficult. Many herbal products claim to clean out your system, yet they do nothing to remove THC from fat cells. The only way to extract THC from fat cells is to exercise and Detox your body while burning fat. The Body Detox Secret. Give Me 5 Minutes... and I'll Show You the Safest Way to Detox! Discover The One Detox Diet That Is Both Best AND Safest for You! How To Achieve Truly Permanent Weight Loss & Long Term Health. You may be able to temporarily clean THC metabolites from your bloodstream, or dilute your fluids to yield a greater urine/THC ratio, but your bloodstream will continue collecting THC metabolites from fat until it has all been absorbed. Your urine will continue collecting THC metabolites from your bloodstream until you have basically burned the metabolites from your body. This is why you may show up dirty on a THC drug test even if you have not smoked pot for up to thirty days! 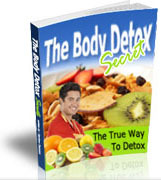 12 Steps To A Complete Body Detox Incredible Health Product On Detox, Weight Loss And Anti Aging. In Just 2 Months I Went From 10 Years Of Debilitating Pain & Constant Fatigue To Training For A Triathlon. " Now I Want To Show YOU The Process That Will Give You A Sustainable Full Body Detox That Achieves Weight Loss, Creates Energy And Vitality Like Crazy!" For More Information, Click HERE! Water: drink plenty of water (after all it is good for you)! Drink water just prior to your drug test. Many people start drinking water several days before the test; which is useless. Water does not clean any THC metabolites out of your system because THC is not water soluble. Water only dilutes urine temporarily. Do not over do it; you can get water intoxication. People have even died from drinking too much water! Hyper saturating your body with fluids will dilute metabolites possibly below the detectable level depending on your metabolism. Be aware that creatinine levels are often tested, and will show that the sample has been diluted. Diluting your sample will also produce clear urine, with virtually no yellow color. Whoever is doing the drug test will assume that you have diluted your sample, and they may reject your sample on the basis of color alone. Master Cleanse Secrets 10 Day Diet. This Ebook Helps People Lose Weight, Detox, And Get Healthy Fast! The best part about the Master Cleanse is it only takes 10 days. That means in less then a week and a half you could be slimmer, healthier, and enjoy more energy. It's really amazing to see what the Master Cleanse can do for a determined person with a strong desire to make a change in their life. For More Information, Click HERE!